If you start to work out when you are already obese, it'll still help you lose weight, but if you'd been active the years before chances are you'd not have such weighty problems and wouldn't have to fear metabolic slow down. Let me answer the question in the headline of today's SuppVersity Article right away, 'cause the answer short and easy: "No!" 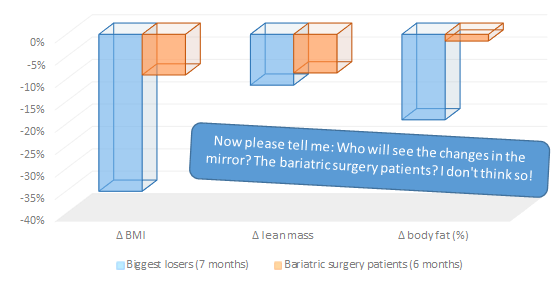 If you compare the body composition of the Biggest Losers who were included in a recent study by scientists from the National Institutes of Health in Bethesda and the Pennington State Biomedical Research Center, the Vanderbilt University School of Medicine and the University of California-Los Angeles to that of their bariatric surgery patients, the "Biggest Losers" (BLC) had lower body fat and higher lean mass percentages than their peers who took the easy way out (Knuth. 2014). What is non-debatable, though, is the fact that the thirteen "Big Losers" also exhibited significantly more reduced resting metabolic rates - a phenomenon that caused quite a stir in two Facebook groups I am frequenting regularly. Biggest Weight Loss Lowest RMR? You Can't Gain Sign. Amounts of Fat in 3 Days! Pastured vs. regular Dairy for Leaner Waists? If you know the exercise drill and "diet" regimen on the TV show, you are probably not surprised to hear that the calorie restriction along with vigorous exercise in BLC participants resulted not just in a higher preservation of fat free mass (FFM), but also in a significantly more pronounced "metabolic adaption" compared to RYGB subjects. Now, the fact that this happened despite comparable weight loss clearly suggests that we are dealing with "metabolic damage", right? Well, this is exactly what neither I, nor Nicolas D. Knuth and his colleagues who published the results of their NIH funded research in the peer-reviewed journal "Obesity" would say. The thing we are dealing with is not "damage", it's adaptation and it's an adaptation process that occurred during the weight loss intervention (30 weeks; see Johannsen. 2012), not after an appropriate reintegration to a normal life. Things to keep in mind: The study at hand confirms what Pourhassan et al. report in another recent study. Reductions in muscle, plasma triiodothyronine and kidney masses explain only 34.9%, 5.3%, and 4.5% of the reduction in RMR (Pourhassan. 2014). And with respect to the false notion that it would be better not to work out, to avoid "metabolic damage", I can only say that DeLany's recent study into the effects of exercise on the reduction in energy expenditure during weight loss interventions is only the latest in a long line of studies that confirm that working out will not just keep the energy expenditure from dropping, it will also improve the dieters' adherence to a given prescribed caloric restriction (DeLany. 2014). Where's the level playing field, here? And how significant are the reductions in leptin (tells the hypothalamus that there is still enough body fat left) and T3 (is the active thyroid hormone and a main determinant of resting metabolic rate) that suggest that the Biggest Losers competition ruined their metabolism temporarily, when they came with significant reductions in blood pressure, andimproved HDL and C-peptide levels, which did not occur in the bariatric surgery group? If you are sitting in the diet trap your situation is similar to the one of the boys and girls suffering from Athletes's Triad and so is the solution! What can a "Big Loser" do to get back to normal REEs fast? Based on the contemporarily available evidence, the best thing they could do was to inject leptin (Rosenbaum. 2005; Kissileff. 2012). Other strategies that may work are strategic overfeeding (for 2-3 days; on a high(er) carbohydrate diet) and intake / supplementation of foods and agents that have been shown to increase leptin in normal-weight or reduced obese individuals. The effects should be similar to those scientists observed with leptin injections - albeit much less rapidly: So be patient if you are going to try any or all of the following tweaks. Possible means to restore leptin to normal would include: Lower omega-3 (Hariri. 2014), total fat (Havel. 1999) and fructose (Teff. 2004), but higher dairy (Wennersberg. 2009) and carbohydrate (Romon. 1999) meals and / or zinc supplements (Chen. 2000) or sugar + phosphate (learn more) and nicotine (Eliasson. 1999) to increase leptin and leucine / EAA-rich proteins (Binder. 2014) or, again, nicotine (Li. 2003) to increase leptin sensitivity. Ah! And don't forget not to overtrain (Jürimäe. 2003) and, of course, to sleep enough (~8h) - sleeping less will lower leptin by >20% (Spiegel. 2004). Moreover, if you look at my plot of the data in Figure 1, you will see that the that it is a perfectly normal adaptations to exuberant caloric deficits (>50%). Figure 2: The metabolic "damage" is rather a metabolic "adaptation" (y-axes; in kcal/day) in response to significant energy deficits (x-axes; calculated energy expenditure (includes exercise induced energy expenditure, therefore it can approach 100%) expressed relative to calculated RMR) - the problems begin with intakes >50% below maintenance. Whether or not the exercise component made things worth, is something that cannot be said based on the data from this study. What it certainly did, though, was to protect the lean mass of the subjects - a vital requirement to achieve what most people are dieting for: Health and being happy with what they see in the mirror. In conjunction with the previously cited health benefits (reduced blood pressure, increased HDL, ...) it would thus be idiotic to use the study at hand as evidence against the repeatedly proven usefulness of exercise for weight loss and health improvements in obese and non-obese individuals. Bottom line: The study at hand ain't the evidence the lazy ones have been waiting for. It's not a free ticket to the surgeon and it does not provide convincing evidence that diet + exercise are not far superior ways of losing weight (compared to bariatric surgery). What the study does show, though, is that the recommendations I made in my previous article "Losing Weight Doesn't Have to Ruin Your Metabolism: No Unexpected Reduction in Energy Expenditure With Sane Weight Loss. Plus: 9 Simple Rules Every Dieter Must Follow" (read more) are spot on: Never (!) stay at a caloric deficit that's >40% of what you'd need on a daily basis for more than maybe a week and take breaks, instead of increasing the calorie deficit, when you feel you're hitting a plateau (read all 9 tips, here) | Comment on Facebook! Ah, and by the way, it's also a myth that formerly obese individuals have necessarily lower resting and total energy expenditures. As Hume et al. found the RMR of ever-lean and formerly overweight women is identical and the ostensibly lower energy expenditure during physical activity is an artifact that's caused by over-reporting of physical activity in the formerly overweight women (Hume. 2013). Chen, Ming-Der, Yuh-Min Song, and Pi-Yao Lin. "Zinc may be a mediator of leptin production in humans." Life sciences 66.22 (2000): 2143-2149. DeLany, James P., et al. "Effect of physical activity on weight loss, energy expenditure, and energy intake during diet induced weight loss." Obesity 22.2 (2014): 363-370. Eliasson, Björn, and Ulf Smith. "Leptin levels in smokers and long‐term users of nicotine gum." European journal of clinical investigation 29.2 (1999): 145-152. Hariri, Mitra, et al. "Does omega‐3 fatty acids supplementation affect circulating leptin levels? A systematic review and meta‐analysis on randomized controlled clinical trials." Clinical endocrinology (2014). Hume, David John, Jacolene Kroff, and Estelle Victoria Lambert. "Resting and activity-related energy expenditure: Do formerly overweight women differ from their ever-lean counterparts?." International Journal of Nutrition and Metabolism 5.8 (2013): 134-139. Johannsen, Darcy L., et al. 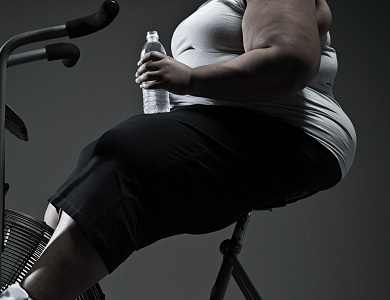 "Metabolic slowing with massive weight loss despite preservation of fat-free mass." The Journal of Clinical Endocrinology & Metabolism 97.7 (2012): 2489-2496. Jürimäe, Jaak, Jarek Mäestu, and Toivo Jürimäe. "Leptin as a marker of training stress in highly trained male rowers?." European journal of applied physiology 90.5-6 (2003): 533-538. Kissileff, Harry R., et al. "Leptin reverses declines in satiation in weight-reduced obese humans." The American journal of clinical nutrition 95.2 (2012): 309-317. Li, Ming D., and Justin K. Kane. "Effect of nicotine on the expression of leptin and forebrain leptin receptors in the rat." Brain research 991.1 (2003): 222-231. Pourhassan, Maryam, et al. "Impact of body composition during weight change on resting energy expenditure and homeostasis model assessment index in overweight nonsmoking adults." The American journal of clinical nutrition (2014): ajcn-071829. Romon, Monique, et al. "Postprandial leptin response to carbohydrate and fat meals in obese women." Journal of the American College of Nutrition 22.3 (2003): 247-251. Rosenbaum, Michael, et al. "Low-dose leptin reverses skeletal muscle, autonomic, and neuroendocrine adaptations to maintenance of reduced weight." Journal of Clinical Investigation 115.12 (2005): 3579-3586. Teff, Karen L., et al. "Dietary fructose reduces circulating insulin and leptin, attenuates postprandial suppression of ghrelin, and increases triglycerides in women." The Journal of Clinical Endocrinology & Metabolism 89.6 (2004): 2963-2972. Wennersberg, Marianne Hauge, et al. "Dairy products and metabolic effects in overweight men and women: results from a 6-mo intervention study." The American journal of clinical nutrition (2009): ajcn-27664.